Carol M. Browner, a principal in the Albright Group, LLC, is currently assistant to the President on energy and climate change. She has "served as head of the United States Environmental Protection Agency, a $7 billion, 18,000-employee agency responsible for protecting the public's air, water, and the health of their communities. She served as a member of the President's Cabinet for eight years. Ms. Browner, an attorney, is widely recognized for her innovative partnerships with the business community and non-governmental organizations, forging common sense, cost-effective solutions to public health and environmental challenges. Accomplishments during her tenure included enacting the strongest-ever national air pollution standards, creating innovative and flexible alternatives to traditional regulatory programs, and leveraging more than $1 billion in public and private funds to cleanup brownfields," her Albright Group biography states. Browner supports the use of oil dispersants in the clean-up of oil spills, stating that they are part of the process of moving forward in the Gulf of Mexico oil spill. She also claims not many dispersants are currently available or available in the quantities needed, an explanation that supports BP's use of Corexit. While at the EPA, Browner took a strong stand on the hazards of secondhand tobacco smoke. EPA recommends that people not smoke in their home or permit others to do so. If a family smokes indoors, we recommend increased ventilation in the area where smoking takes place by opening windows or using exhaust fans. We also recommend that smoking should not occur if children are present, particularly infants and toddlers. Baby-sitters and others who work in the home should not be allowed to smoke in the house or near children. 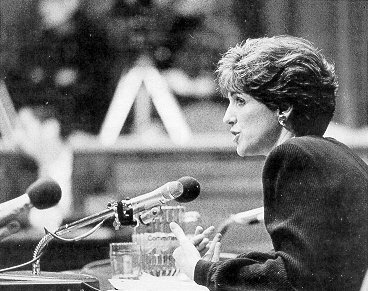 In 1998, Browner gave another statement about secondhand smoke to Congress, announcing new EPA efforts to educate the public about the hazards of secondhand smoke exposure. ↑ "Transcript of American Morning," CNN, May 25, 2010. ↑ George Stephanopoulos, "Carol Browner: Gulf Oil Spill is Worst in History," ABC News, May 25, 2010. "Carol M. Browner, Principal", The Albright Group, undated, accessed May 2006. This page was last edited on 21 June 2017, at 17:13.